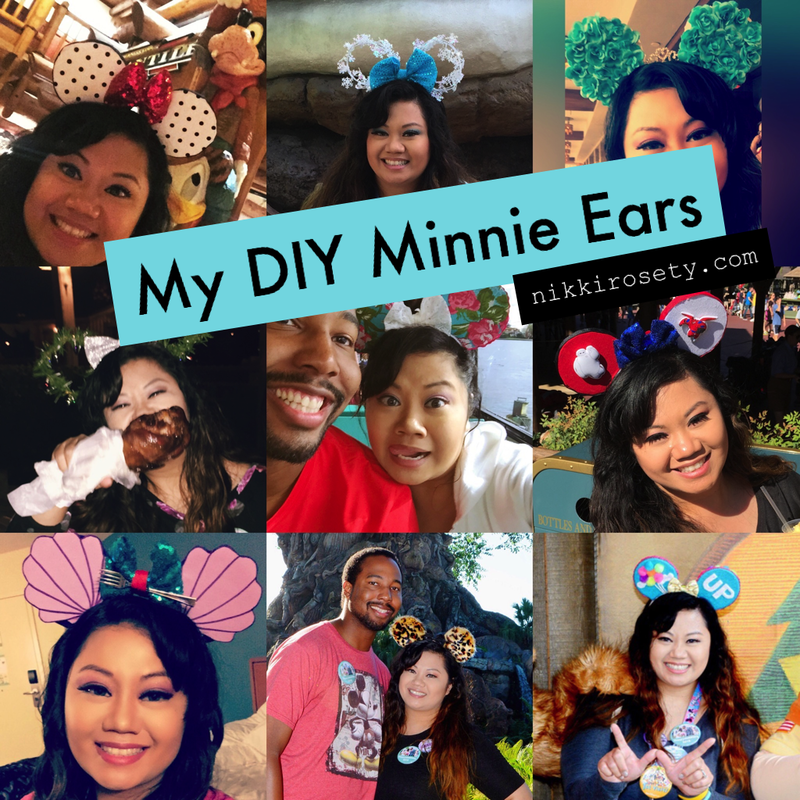 My DIY Minnie Mouse Ears! Ever since Prentyce and I decided that we were going to go to Walt Disney World for honeymoon, I became obsessed with creating Minnie Mouse ears. They are just so cute and you can get so creative with them, plus I love DIY projects! I decided to do a post about them since I get asked about them a lot (mostly by my Disney lovin’ coworkers). We were originally going to go to Orlando in early September. Our plans changed due to a very unfortunate family situation. So, our trip was canceled the minute we landed on Orlando. We flew right back. I had made ears for my trip at that time, but since we then decided to reschedule our trip to early December, I had to go and make some new Minnie ears and actually fix some of the ones that had already broken while I was traveling. Tip: Put them in your carry-on in a plastic bin (if you can). I used a large Iris latching bin and bubble wrap. This may not happen to you, but they were damaged in my check-in luggage. One of the two ears I added due to our December trip were my wreath ears with small little Christmas lights. My husband actually offered to make these light up for me with his electrical engineering skills, but it was too late at that time. I regret not letting him do it now; they would’ve looked so cool at the Very Merry Christmas Party. For this, I actually used the wired green thing they give you to wrap around your artificial Christmas tree to keep it from opening. I’m sure this is something you will be able to find at a craft store during the holidays. The small Christmas lights were from Michaels. The silver bow I ordered online here! The second set of ears I added were my Frozen themed ears. This was one of my faves because turquoise is my favorite color! I use wired white tinsel (with snowflakes!) that I got from Hobby Lobby to create the circular ear pattern. I think I got it for less than $2 around Christmas time. Since they were wired, they stayed in the circular shape! The sequin bow I made from sequin fabric at Joann’s. I only purchased 1/8 of a yard (less than $3) to make the sequin bow! Now, on to the other ears I made for the trip! I made so many because I knew I wanted a different pair to wear every single day. I tried to match them with my outfits too. That didn’t always pan out, but I tried. I also picked ears for the day depending on what park we were going to or character meet we had planned. Note that I created my Minnie ears on my own. I adore DIY and I love personalized things, but, if I was a baller, trust and believe I would’ve bought some ears from Etsy. There are amazing ears out there! But, for now, just look at mine and be amazed. Start your expectations low, okay? Just kidding. Maybe. Up ears – My absolute favorite Disney movie is now Up. Who doesn’t love a love story? Everything about this movie makes me feel so good. I wish I could’ve met Carl at Disney World, but he is not a regular character meet there. I did, however, meet Dug and Russell in Disney’s Animal Kingdom. I told my husband that if I had to choose one character meet, it would have been this one. I used felt (cut in shapes), fuzzy balls, and yarn to make these ears. The bow was purchased online here. The bow on these years are smaller than most of my other ears because I wanted the balloons and clouds to not be covered up. Baymax ears – I wore these on the day that we were exploring Tomorrowland. Unfortunately, Baymax does not have a meet and greet at Disney World. The bow was ordered from here and the Baymax pieces are from here. They were keychains that I cut up and glued on my ear parts. Floral ears – These are very popular online; they are one of the easiest ears I made. There are a few YouTube tutorial videos on how to make these! They were not very expensive either. I put a crown on this one instead of a bow, cause I didn’t want it to block the flowers. You can buy this little crown (it’s a tiara clip) here or at an accessories store like Claire’s. Pearl bow ears – I used a $1 flower girl/toddler dress I found at Goodwill for the fabric of the stress. I purchased the pearl bow online here. I don’t have a photo of me wearing these ears because I forgot to wear them on the trip! Grrr. Fuzzy animal print ears – These were some of the hardest ears to make for two reasons. It was really hard to cut the fuzzy material (fur got everywhere!) and they were the first ears I made so, I wasn’t really sure what I was doing. I got the fuzzy material in the felt section at Michaels. The bow was purchased online here. Fluffy lace ears – I made these using sleeves from a lace shirt I found at Goodwill for $1. The sequin bow was purchased online here. Floral print with lace bow ears – I used fabric found in the fabric section at either Walmart or Michaels. I think it was only $1, because it was a small piece of fabric, maybe 12 x 18″ in size. I made the lace bow using a lace headband for infants (from here). I just cut it up and put it in a bow shape. I wouldn’t do this again, because I think the bow is way too small. Plus, it kept drooping forward because the lace was soft and that looked tacky. Ariel clam shell ears – These are one of the last ears I made. I think I hesitated and waited so long because I didn’t know how I was going to achieve the clamshell look. I used foam and outlined a clam shell image on it with a purple marker and then cut it out. I found the miniature forks at Dollar Tree; they are supposed to be for appetizers. The bow was purchased online here. And, that’s it folks! I hope you enjoyed all the pictures and info. I’ll be creating more posts on this topic, including tips on DIY. Have fun creating your ears! If you have questions, don’t hesitate to ask!